10 Must-Visit Andhra Special Hotels in Bangalore for a meal of your life time. Unlimited rice, scrumptious dal, spicy gravies, tongue tickling pickles, super tasty papads, and a variety of Sambars are what makes a delicious plate of Andhra meal. Masala and ingredients that are put in preparing an authentic spicy meal of Andhra have a savory aroma of desiness in it. The ambrosial and piquant flavor of Andhra cuisine is something you should try without taking a chance of missing it. Bengaluru being the hub for all kinds of foods, it is not an exception to flavorsome Andhra meals. If you are already drooling for it then check out this list of best Andhra Special Hotels in Bangalore compiled in today’s article. One of the hyped up food points in the city for Andhra meals, Meghan foods easily tops the list of best Andhra meal hotels of Bangalore. It is an amazing crowd puller and place will be jam packed almost all the time. If you want to have the best Andhra style dum biriyani then Meghana Foods is the best bet. You may feel that it is quite pricey but the taste of food makes you forget about it. It is not a place of great ambiance but the food is simply awesome. Must Have – Hyderabadi Biriyani, Dum Biriyani, Vegetable Biriyani, Tangri Kabab, Andhra Meal. Open: 12:00 PM to 4:00 PM and 7:00 to 11 PM. Where: 124, Near Jyothi Nivas College, 1st Cross, KHB Colony | 4th Block Jayanagar | Above Sony Centre | Near Indiranagar Metro. If you are looking for a simple Andhra meal then opt for Bhojanam of Nadhana Palace that consists of White rice, gun powder, ghee, akkurapappu, vepudu, sambar, rasam, majjige pulusu, perugu, fried chillies, appalam, special pachadi, gongura pickle, mango pickle, and a sweet. For non-veg lovers, they have yummy Nellore chicken biriyani, Hyderabad mutton biriyani and other cuisines on the menu. It is a place of one bite and your taste buds come back to your life. Where: St. Thomas Town, Kammanahalli Main Road, Kammanahalli, Bangalore | New BEL Road | Rajajinagar and 10 other locations (You can google out). Without a second thought, Nagarjuna is the best of the best Andhra Restaurants in Bangalore that brings the real taste of Andhra to your table. Their flavors and spices can make you drool for water. The spinach gravy (Dal Palak) is the best and Anjali fish is divine. Have an unlimited meal at a price which is way too affordable compared to other hotels in the city. It is better to avoid chicken biriyani here but do not make that sin of not tasting the super delicious prawns. This place is a feast for both Vegetarians and Non-vegetarians. Where: Residency Road | Next to More Mega Store, Maratahalli | Double Road, Indiranagar | KHB Colony, Koramangala 5th block | Jayanagar 3rd block. In outskirts like Marathahalli Bhagini Deluxe is a savior for food lovers. Experience 300 different dishes and every dish can bowl you over with its taste and flavors. Definitely, a must-try. Where: Near Marathahalli Bridge, Ashwathnagar, Marathahalli. Bheema’s is counted as one among the legendary foodlets of Bangalore. Never say NO to Andhra meals at this legendary place. Have a full-complete meal with Chicken 65 as a side dish. Please don’t go to this restaurant when your stomach is half filled and blame me if you couldn’t eat much but you actually wanted to eat. Standard Order: Veg Meal, Chicken 65, Chilli Chicken, Mutton Biriyani, and Thumsup. Open: 12:00 PM to 3:30 PM and 7:00 PM to 10:30 PM. Arguably the BEST place to satisfy your appetite for Yumm Biriyani. I would like to give all points to the ambiance, food, service, and staff. If the Andhra Carrier meals served here doesn’t give you the utmost satisfaction then nothing in the world can satisfy you. One of the sought after Andhra Restaurants of Bangalore after Nagarjuna. Open: 11:30 AM to 3:30 PM and 7 PM to 11 PM. Where: 60 Feet Road, BEML Layout, Near BEML Bus Depot, Rajarajeshwari Nagar. Rayalaseema is a place in Andhra Pradesh and this outlet is named after it. Ruchulu translates to Taste and so Rayalaseema Ruchulu brings the taste of Rayalaseema with great flavors to your plate. This Andhra restaurant is known for the spicy meal and is a known name in Telangana. So, when you are here please try Ragi Sangati (Ragi Balls), Paya Soup, Nati Kodi Polsu, Payasam, and Ulavachuru Kodi Pulav. Where: 1st Floor, 12th Main Road, Above mama goto restaurant Indiranagar. Annapoorna is one of the age old restaurants of Bangalore known for Andhra food. It is an absolute fiesta for Andhra Food lovers. Just a plate of Rangi Sangati, Pappu Charu Annam, Ulavachuru Soup, and tangy pickle is enough to get a smile on the face of your tummy. You can also relish biriyani (Chicken and Mutton) and a thin piece of fish. Where: 6th Cross, Gandhinagar, Majestic Area, Majestic, Bangalore. This hotel has everything Non-Vegetarian but you better ignore everything and stick to Andhra specials like Guntur chicken, Boti, and Nati Biriyani. If you don’t want to go to a restaurant and wish to have home-made food Andhra food then Sumi’s kitchen is for you. A foodlet run in a cozy apartment set out Andhra Brahmin Food during Weekends. It is an off-beat place to stop by for a pre-booked meal. Where: B3, Hutchins Court, 18/1, Hutchins Main Road, Cooke Town. Contact: +91 8951153518 ( Make sure you book at least three days in advance). So, this was the list of Andhra Special Hotels in Bangalore. If you know any places of this kind then please let us know in the comments below. 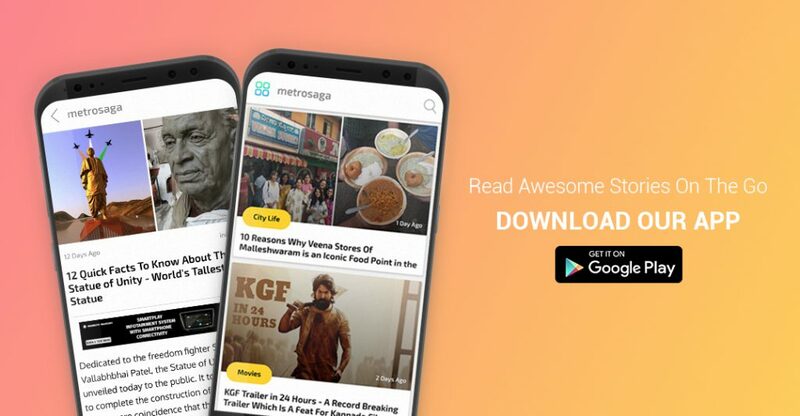 Do not forget to Subscribe to Metrosaga for more updates.